In 2017, there were 5,564 registered hospitals in the U.S., according to the American Hospital Association. Many of these hospitals have radiation therapy departments that are offering the most advanced treatments available to date. New imaging/treatment rooms feature designs that better accommodate many of these new therapies but there remain challenges to the safe delivery of these regimens. One example is the issue of respiratory motion in image-guided radiotherapy, which can cause artifacts during image acquisition adversely affecting dose-calculation accuracy. Various internal body parts including lungs, esophagus, liver and so on move with breathing, and respiratory motion varies daily. Additionally, the amount a tumor can move during breathing can vary widely. As we know, simply adding treatment margins to cover the limits of motion or increasing irradiated volume is neither safe nor recommended as this results in an increase in the volume of normal tissues being exposed to high dose treatment. Mitigation of the consequences of respiratory motion is now accomplished using a variety of approaches including respiratory gating and tumor tracking, active breathing control or motion restricting using abdominal compression devices that limit respiratory excursion. An antiquated compression method, available from several manufacturers of stereotactic body frames, makes use of “a small pressing plate”. This less popular concept uses a plate that is pressed down onto the abdomen just below the sternum. The force is adjusted by means of a screw. Although the force applied is determined in consultation with the patient, its actual value, and thus the reproducibility of the setup between simulation and each treatment is unknown. Furthermore, for abdominal sites, the pressure plate itself and the arch and screw system will attenuate beams from some directions, possibly preventing such directions from being used, or increasing uncertainties of beams passing through the system. Due to the problems associated with this method, there has been a movement away from pressure plates. Newer designs of assistive positioning devices however have proven to be more effective in ensuring the precise targeting of a tumor’s location and more patient friendly. One of the most effective is a respiratory compression belt. Aktina Medical, a pioneer in respiratory compression belts now leads the way with their newest version. Comprising of a nylon belt with an air bladder, which lies over the patient’s abdomen under the nylon belt. There is no pressure plate which minimizes patient discomfort and the pressure can be set reproducibly each treatment. 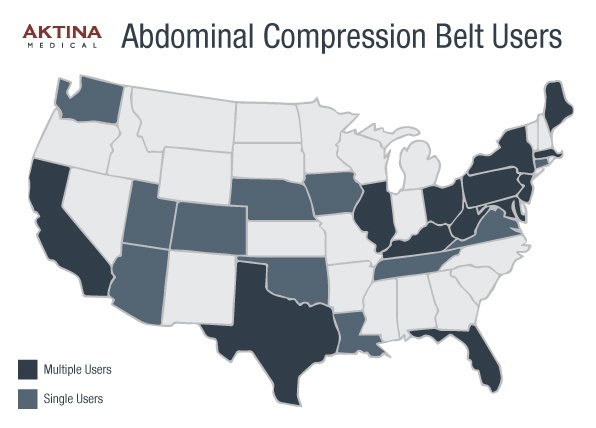 The compression belt provides evenly distributed pressure around the entire periphery of the patient’s abdomen, ensuring reproducible results for each imaging and treatment session. Ideal for abdominal and lung treatments, the respiratory compression belt allows for the application of user defined pressure; and is adjustable to allow for different size patients. Aktina’s patented enhancements such as remote access allows therapists to monitor and adjust the belt pressure from outside the treatment vault as well as from inside. Multiple studies using the Aktina System have proven that the use of a respiratory compression belt resulted in substantial reduction in respiratory motion excursion of abdominal tumors.